There are numerous options on the market today that support network traffic redirection. Each of these supports similar and even multiple methodologies for controlling network flow based on the application requirements. To simplify these methodologies, we consider three categories: Database Server Invoked API, Network Appliance Polling, or a combination of both. The following section will outline each of these methodologies and provide guidance on how each of these can be integrated with InterSystems products. In all scenarios the arbiter is used to provide safe failover decisions when the mirror members cannot directly communicate. Details on the arbiter can be found here. For the purposes of this article, the example diagrams will depict 3 mirror members: primary, backup, and DR Async. However, we recognize your configuration may have greater or fewer than this. In this method, the network load-balancing appliance uses its built in polling mechanism to communicate with both mirror members to determine the primary mirror member. A polling method using the CSP Gateway’s mirror_status.cxw page available in 2017.1 can be used as the polling method in the ELB health monitor to each mirror member added to the ELB server pool. Only the primary mirror will respond ‘SUCCESS’ thus directing network traffic to only the active primary mirror member. This method does not require any logic to be added to ^ZMIRROR. Please note that most load-balancing network appliances have a limit on the frequency of running the status check. Typically, the highest frequency is no less than 5 seconds, which is usually acceptable to support most uptime service level agreements. A HTTP request for the following resource will test the Mirror Member status of the LOCAL Cache configuration. For all other cases, the path to these Mirror status requests should resolve to the appropriate Cache server and NameSpace using the same hierarchical mechanism as that used for requesting real CSP pages. Note: A CSP license is not consumed by invoking a Mirror Status check. Consider the following diagrams as an example of polling. 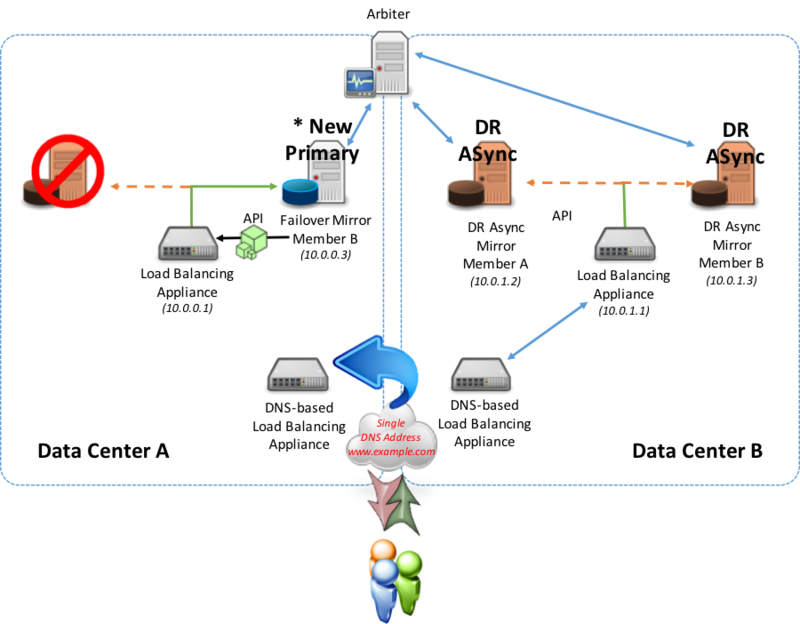 The following diagram demonstrates the promotion of DR asynchronous mirror member(s) into the load-balanced pool, this typically assumes the same load-balancing network appliance is servicing all mirror members (geographically split scenarios are covered later in this article). As per standard DR procedure the promotion of the disaster recovery member involves a human decision and then a simple administrative action at the database level. Once that action is taken however, no administrative action is required on the network appliance: it automatically discovers the new primary. In this method the network traffic management appliance is used and has a server pool defined with both failover mirror members and potentially DR asynchronous mirror member(s). When a mirror member becomes the primary mirror member an API call is issued to the network appliance to adjust the priority or weighting to immediately instruct the network appliance to direct network traffic to the new primary mirror member. The same model applies to promotion of a DR Async mirror member in the event of both the primary and backup mirror members become unavailable. Within this procedure call, insert whatever API logic and methods available for the corresponding network appliance such as REST API, command line interface, etc. Just as with Virtual IP, this is an abrupt change in network configuration and does not involve any application logic to inform existing clients connected to the failed primary mirror member that a failover is happening. Depending on the nature of the failure, those connections can get terminated as a result of the failure itself, due to application timeout or error, due to the new primary forcing the old primary instance down, or due to expiration of the TCP keep-alive timer used by the client. As a result, users may have to reconnect and log in. You application’s behavior would determine this behavior. 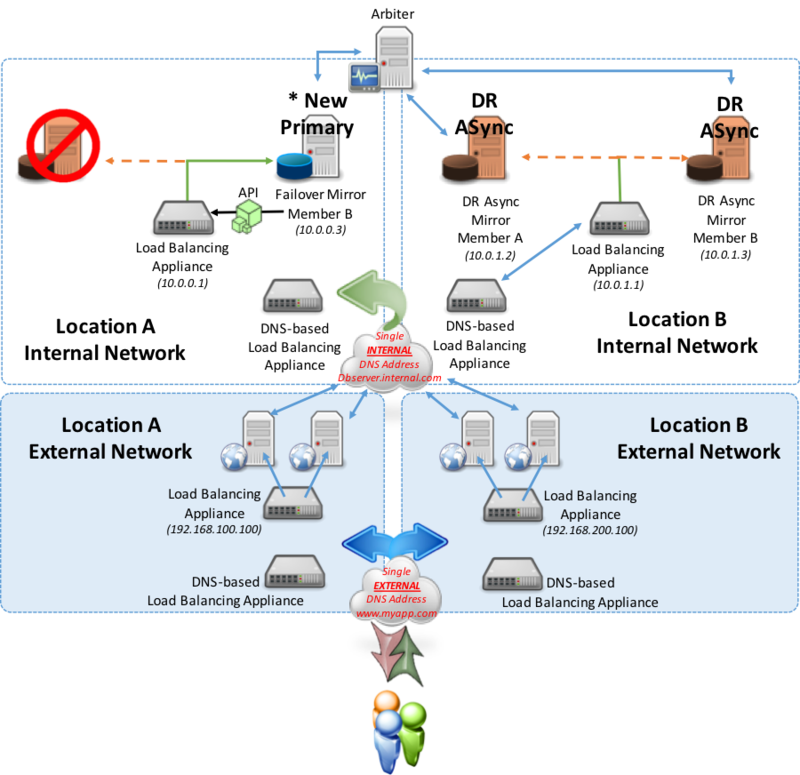 In configurations with multiple data centers and possibly geographically dispersed deployments such as cloud deployments with multiple availability zones and geographic zones, the need arises to account for geographic redirection practices in a simple and easily supported model using both DNS based load balancing and local load balancing. 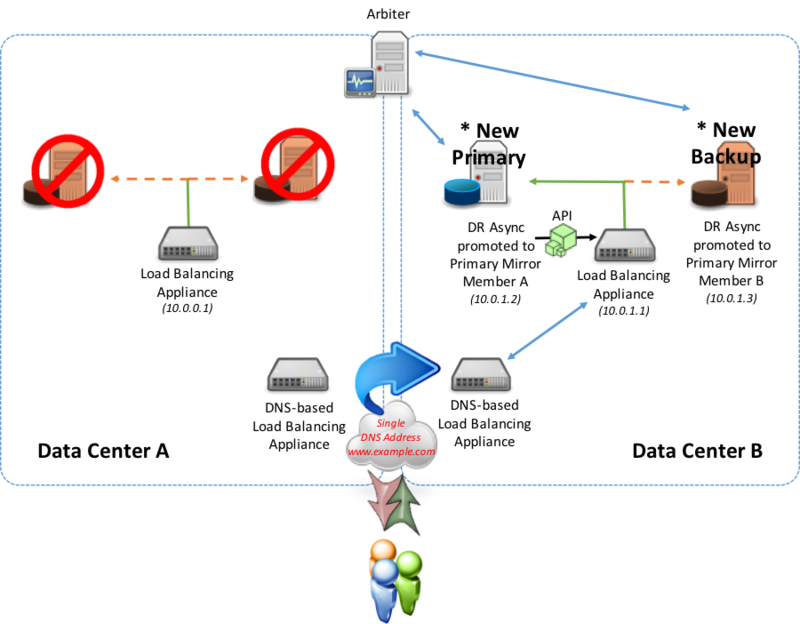 With this combination model, the introduction of an additional network appliance that works with DNS services such as Amazon Route 53, F5 Global Traffic Manager, Citrix NetScaler Global Server Load Balancing, or Cisco Global Site Selector in combination with network load-balancers in each data center, availability zone, or cloud geo-region is made. In this model, either of the polling (recommended) or API methods described earlier are used locally to the location operating any of the mirror members (failover or DR Async). This is used to report to the geographic/global network appliance whether it can direct traffic to either of the data centers. Also in this configuration the local network traffic management appliance presents its own VIP to the geographic/global network appliance. In a normal steady state, the active primary mirror member is reporting to the local network appliance that it is primary and providing an “Up” status. This “Up” status is relayed to the geographic/global appliance to adjust and maintain the DNS record to forward all requests to this active primary mirror member. In a failover scenario within the same data center (backup synchronous mirror member becomes primary), either API or polling method is used with the local load-balancer to now redirect to the new primary mirror member within the same data center. No changes are made to the geographic/global appliance since the local load-balancer is still responding with the “Up” status because the new primary mirror member is active. For the purposes of this example, the API method is used in the diagram below for local integration to the network appliance. 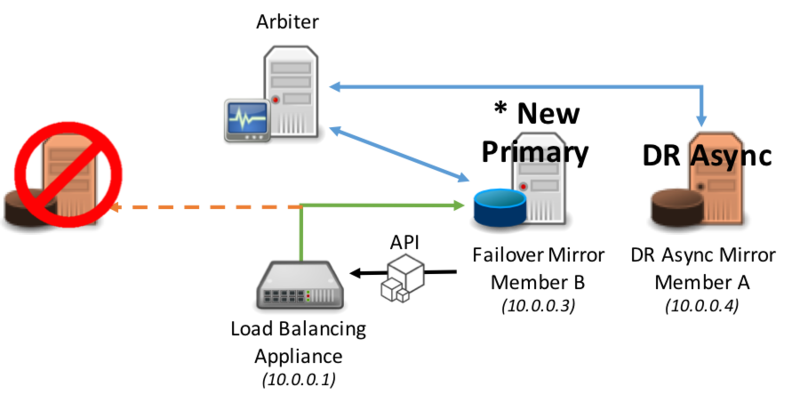 In a failover scenario to a different data center, (either a synchronous mirror or DR asynchronous mirror member in an alternate data center) using either the API or polling methods, the newly promoted primary mirror member starts reporting as primary to the local network appliance. During the failover, the data center that was once contained the primary is now no longer reporting “Up” from the local load-balancer to the geographic/global. 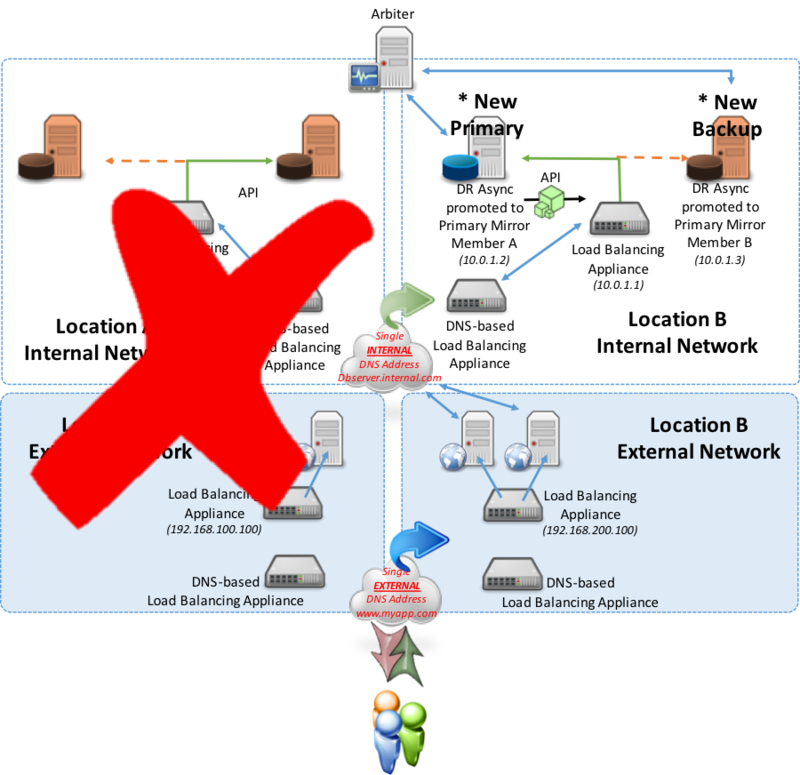 The geographic/global appliance will not direct traffic to that local appliance. The alternate data center’s local appliance will report “Up” to the geographic/global appliance and will invoke the DNS record update to now direct to the Virtual IP presented by the alternate data center’s local load-balancer. To take the solution a step further, the introduction of a separate web server tier is made either as an internal to private WAN or accessible via Internet. This option may be a typical deployment model for large enterprise applications. The following example shows a sample configuration using multiple network appliances to securely isolate and support the web and database tiers. 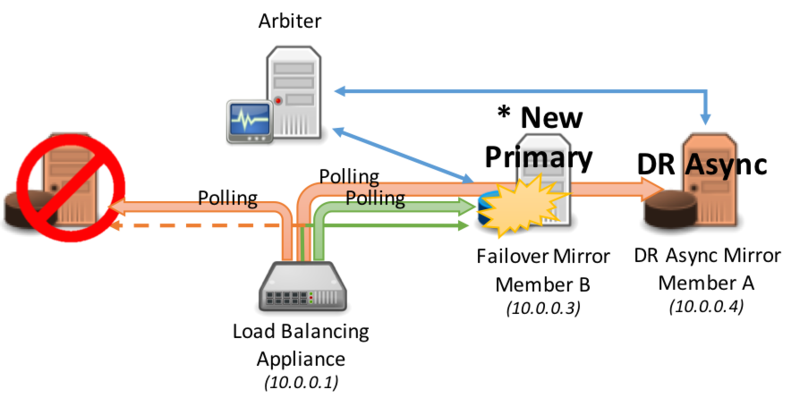 In this model two geographically dispersed locations are used with one location deemed the “primary” location and the other location is purely “disaster recovery” for the database tier. The database tier disaster recovery location is to be used in the event the primary location is out of service for any reason. Additionally, the web tier in this example will be illustrated as being active-active meaning users are directed to either location based on various rules such as lowest latency, lowest connections, IP address ranges, or other routing rules you deem appropriate. 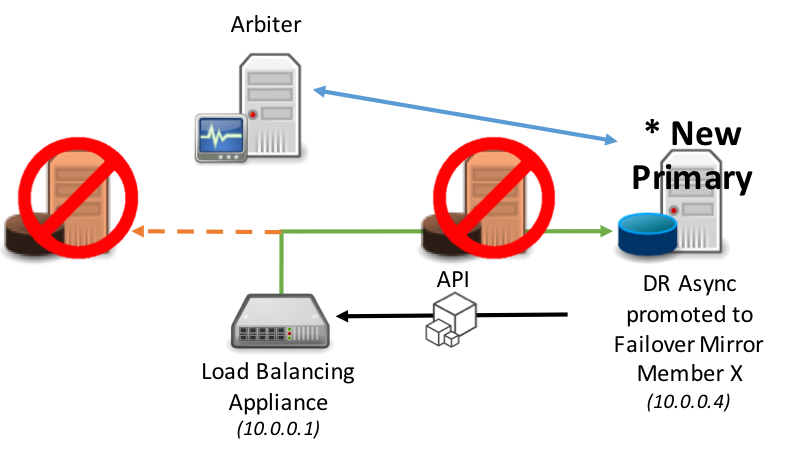 As the above example shows, in the event of a failover within the same location automatic failover occurs and the local network appliance now points to the new primary. Users still connect to either location’s web servers and web servers with the their associated CSP Gateway continue to point to Location A. In the next example, consider an entire failover or outage at Location A in which both the primary and backup failover mirror members are out of commission. The DR Async mirror members would then be manually promoted to primary and backup failover mirror members. Upon that promotion, the new designated primary mirror member will allow Location B’s load balancing appliance to report “Up” using the API method discussed earlier (polling method is an option as well). As a result of the local load balancer now reporting “Up”, the DNS-Based appliance will recognize that and redirect traffic from Location A to now Location B for database server services. There are many possible permutations of designing mirror failover without a Virtual IP. These options can be applied to either the simplest of high availability scenarios or multi-geographic region deployments with multiple tiers including both failover and DR Async mirror members for a highly available and disaster tolerant solution aiming to sustain the highest levels of operational resilience for your applications. Hopefully this article has provided some insight on the different combinations and use cases possible for successfully deploying database mirroring with failover that are suitable for your application and availability requirements. Thank you for the article, Mark. I have a couple of questions on your "Option 3: Geographically Dispersed Deployments". You placed two DR acync nodes at Data Center B. So, the data flow from Primary (at Data Center A) to DR async (at Data Center B) will be doubled. In general, WAN is not too quick, so it may increase latency. More important that mirrored databases at both DR async nodes may have different states (due to different latency), and it would be difficult to decide which of them should be promoted as a new Primary. And how to catch up the database at the new Secondary, if we can't guarantee that it is in the same state as at the new Primary? WAN connectivity varies significantly and many factors play into the requirements and latency. You can get very good (fast and reliable) WAN connectivity, however distance impacts latency, so you need to be careful in your planning. As for deciding which mirror to promote... This is one of the reasons we do not recommend automating the promotion of a DR Async member to become primary. You will want to evaluate the state (or reported latency) within the ^MIRROR utility on each DR Async member to determine which one (maybe both?) are current or not. If they are out of sync with each other, you will need to manually rebuild the "new backup" in the secondary data center based on the newly promoted DR Async member. Yes. Latency is a major factor when considering geographically splitting synchronous mirrors. You will need to really understand the given application and workload to know how much latency can be tolerated. Some applications can accept latency (to a certain level) however others may not. We do have deployments with each synchronous member located in different locations and latency is single digit millisecond latency and only separated by about 100 miles, so there is tolerable latency in this configuration for this application. Unfortunately there is no absolute formula here to determine if a particular application can leverage that type of a deployment strategy. The first things to consider is monitor the current journal physical write rate of the application with ^mgstat or ^pButtons during peak workloads. You also need to understand if ECP is heavily used because this will have an impact on the the number of journal sync calls for ECP durability guarantees . Usually looking at IO rates with iostat (Linux or UNIX) or PERFMON.EXE (Windows) of the journal volume will give you a good indication of the mirror throughput you will need. Using that figure you can work out what maximum latency should be as a start. Say on a given system you see the journal write rate from pButtons/mgstat is relatively low at only 10-20 journal writes per second. Let's assume these are full 64KB journal buffer writes - so bandwidth requirements will be in the neighborhood of 1.3 Mbytes / second (or 10Mbit / second) as a minimum. I would recommend allocating at least 20Mbit or more to ensure spikes can be efficiently handled. However when looking at iostat output you notice the journal volume is doing 200 writes per second because the application is using ECP clients (application servers). So with this example, we know that at a minimum synchronous mirroring will need at least 20Mbps of bandwidth and latency less than 5 milliseconds. I came to the 5 millisecond requirement by taking 1000 milliseconds (1 second) and divide by 200 journal IOPS. This gives the maximum latency of 5ms to sustain 200 IOPS. This is by no means the absolute requirement for the application. This is a simple starting point to understanding the requirement scope for WAN connectivity, and the application needs to be thoroughly tested to confirm transaction/processing response times are adequate. May I ask you to clarify a bit. Am I right thinking that journal transfer is acknowledged only when it runs between failover nodes, so network latency is not a great problem for async communications? Of course, the bigger latency the bigger journal transfer delay, but it would not slow down the primary node operation. E.g., if we have average 10-20 JrnWrts per second during each busy hour (with spikes up to 300), for right async WAN planning I should take in account that the latency <= 50 ms (1000/20=50) should be sufficient if we can live with DR async node that is usually about several seconds behind the primary? As I can remind, shadowing allows cascading. Don't you think that cascading can be a good option for deploying of several async nodes at one (long distance) location as well? You are correct that latency is only a major consideration for synchronous (failover) mirror members. In an async member, latency to/from the primary mirror member does not slow down the primary mirror member processing. Like you mentioned it only impacts the delay in the async mirror member being "caught up". Your example is perfectly fine for DR Async, and if the DR Async should fall behind for any reason, it will put itself into "catch up mode". In all cases this does not impact the primary mirror member performance. I'd like to mention that in DR Async mirror members we also use compression as a means to be sensitive to bandwidth requirements, so if sizing a WAN link for DR Async consider that the bandwidth requirements will be less due to compression. As for cascading mirrors, that currently is not a feature we support today. Thanks again for your excellent questions. Very useful article - thanks, Mark. For the "database server invoked API" method, do you have any example call-outs to common load balancers, such as an AWS ELB or a Kemp load balancer? For the "Network Appliance Polling" method, you mentioned "in 2016+ versions a formal mirror_status page will be made available in the product". Is that now available? If so, what is the URL? The call-out method is highly customized and depends on the API features of a particular load balancer. Basically the code is to added to the ^ZMIRROR routine to call whatever API/CLI is available from the load balancer (or the EC2 CLI calls). For the appliance polling method (the one I recommend because it is very simple and clean). Here is a section from my AWS reference architecture article found here. The link also provides some good diagrams showing the usage.